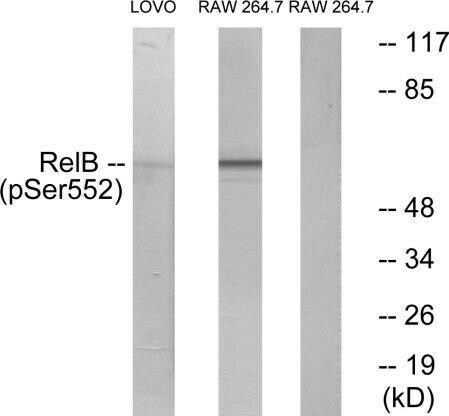 ab47366 detects endogenous levels of Rel B only when phosphorylated at serine 573. Synthetic peptide corresponding to Human Rel B (phospho S573). Synthesized peptide derived from human RelB around the phosphorylation site of Ser573. The antibody was affinity-purified from rabbit antiserum by affinity chromatography using epitope-specific phosphopeptide. The antibody against non-phosphopeptide was removed by chromatography using non-phosphopeptide corresponding to the phosphorylation site. Our Abpromise guarantee covers the use of ab47366 in the following tested applications. WB 1/500 - 1/1000. Predicted molecular weight: 62 kDa. NF-kappa-B is a pleiotropic transcription factor which is present in almost all cell types and is involved in many biological processed such as inflammation, immunity, differentiation, cell growth, tumorigenesis and apoptosis. NF-kappa-B is a homo- or heterodimeric complex formed by the Rel-like domain-containing proteins RELA/p65, RELB, NFKB1/p105, NFKB1/p50, REL and NFKB2/p52. The dimers bind at kappa-B sites in the DNA of their target genes and the individual dimers have distinct preferences for different kappa-B sites that they can bind with distinguishable affinity and specificity. Different dimer combinations act as transcriptional activators or repressors, respectively. NF-kappa-B is controlled by various mechanisms of post-translational modification and subcellular compartmentalization as well as by interactions with other cofactors or corepressors. NF-kappa-B complexes are held in the cytoplasm in an inactive state complexed with members of the NF-kappa-B inhibitor (I-kappa-B) family. In a conventional activation pathway, I-kappa-B is phosphorylated by I-kappa-B kinases (IKKs) in response to different activators, subsequently degraded thus liberating the active NF-kappa-B complex which translocates to the nucleus. NF-kappa-B heterodimeric RelB-p50 and RelB-p52 complexes are transcriptional activators. RELB neither associates with DNA nor with RELA/p65 or REL. Stimulates promoter activity in the presence of NFKB2/p49. Both N- and C-terminal domains are required for transcriptional activation. Nucleus. Cytoplasm > cytoskeleton > centrosome. Co-localizes with NEK6 in the centrosome. 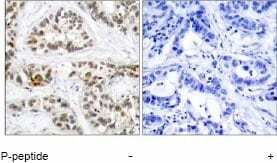 Immunohistochemical analysis of paraffin-embedded human breast carcinoma tissue using ab47366. Image on the left is tissue untreated with immunising peptide; image on the right is tissue treated with immunising peptide. ab47366 has not yet been referenced specifically in any publications. Publishing research using ab47366? Please let us know so that we can cite the reference in this datasheet. Abcam takes product quality seriously and we recently undertook an in-depth study examining storage conditions and antibody performance. After over 13,000 individual ELISA experiments, we have determined that storing our antibodies at various temperatures of up to 45°C for 1 week does not impact their activity. I would be happy to share a summary of our findings with you; please let me know if you would like to see this. As a precautionary measure only, we ship our antibodies in packaging with ice packs to provide extra temperature stability in transit. The ice pack may be thawed or even at room temperature when you receive it; please be assured that this is normal and that your product is safe to use. Once you have received the vial, please follow the long-term storage instructions on the datasheet.